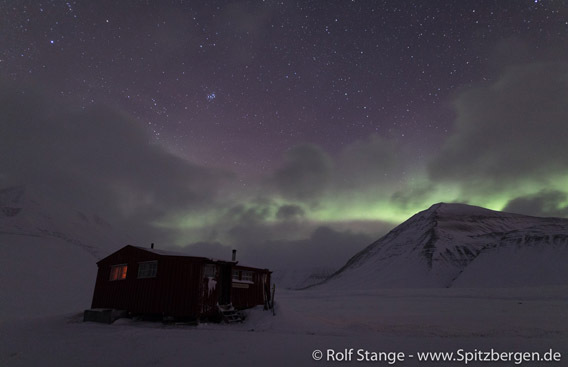 The police raid on the local drug scene – which is not the world’s biggest one – was probably the biggest public excitement in August in Longyearbyen. They have to show every couple of years that drugs are not tolerated in such a small and remote community. This appears not to have been a great success this year, as they had to release those again who were initially taken in custody. But on the other hand, if you find out in the end that nothing much had happened (at least as far as you have evidence for), then it is not a bad thing either, is it? 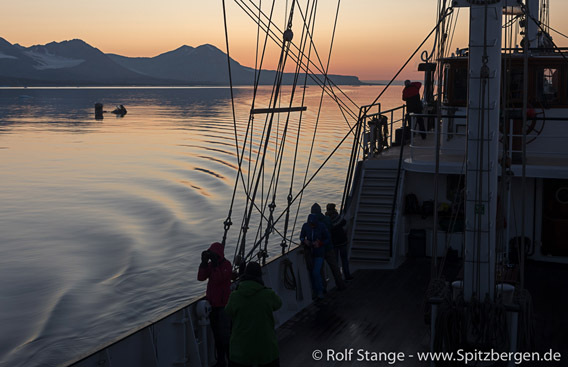 As far as I am concerned, I continued around Svalbard on board Arctica II (“advanced Spitsbergen”; there is still, by the way, an empty seat on this (German speaking) trip in 2018). 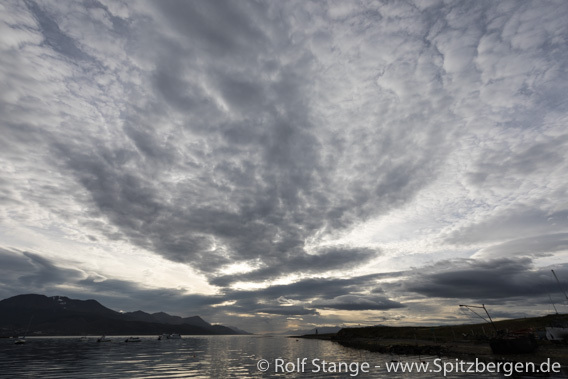 In that sense, August started in late July, as that’s when we left Longyearbyen again. And on the very same day we could venture for a lovely walk on Bohemanflya. 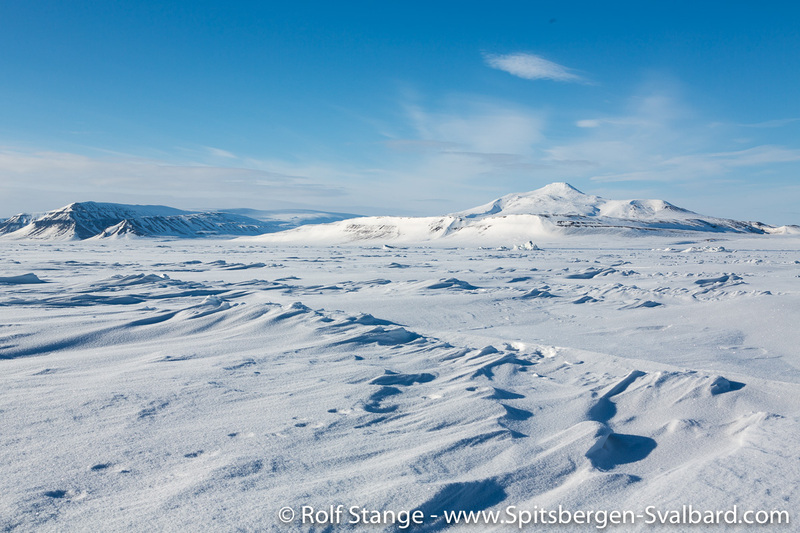 Which is really not far away from Longyearbyen, but you have to have the right weather for a landing there, and we did! The weather continued to be fine for some time. 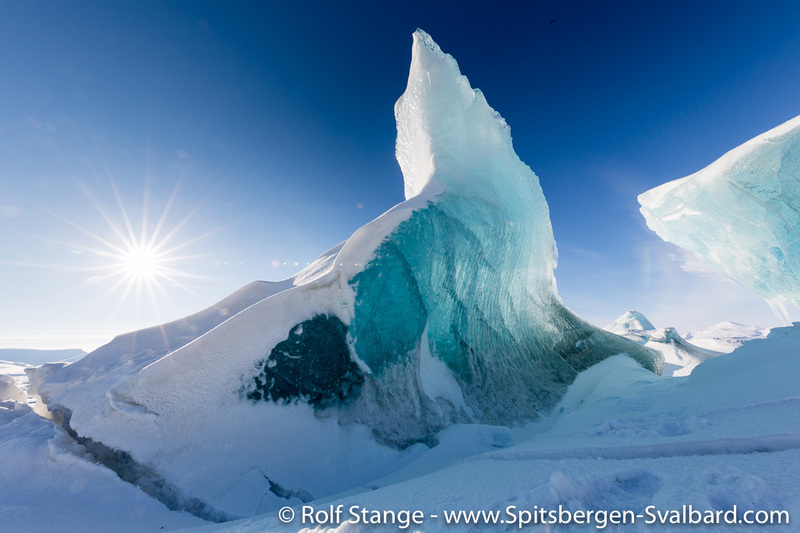 I don’t know how many times I had sailed up and down the northern west coast of Spitsbergen, between Kongsfjord and Magdalenefjord, that bit of coast that is known as “Dei Sju Isfjella” (“the seven icebergs”) since the 17th century? And I had never been ashore on this exposed, wild coastline! Obviously a situation that could not be tolerated forever. In bright sunshine and amazingly calm seas, we went ashore in Kvedfjordbukta and enjoyed life there for a while, feeling that we might be the first people there in many years. And that may actually have been pretty close to the truth. A good feeling that we could enjoy yet another couple of times during this trip! Kvedfjordbukta: rare opportunity for a landing there in perfect conditions. 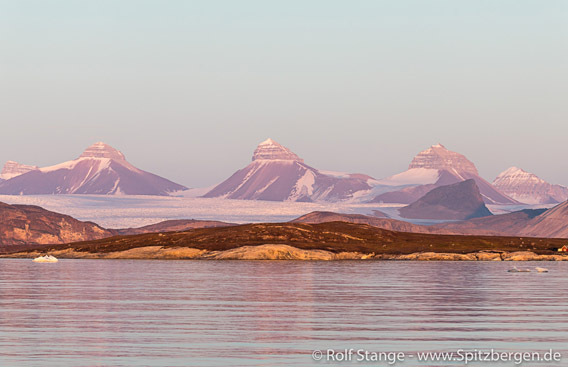 There is no land in Svalbard north of Rossøya. Heinrich Eggenfellner is putting us ashore. 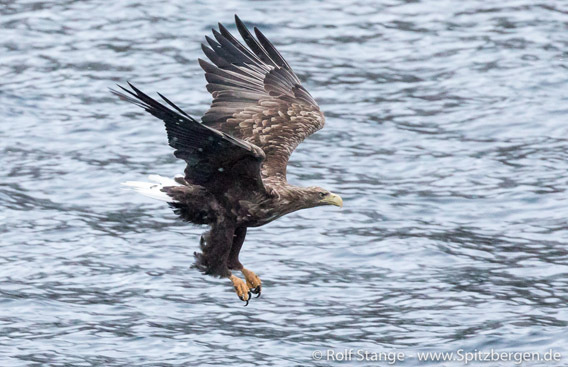 In this way I could continue, raving on about many lovely landings, but we did certainly not ignore the wildlife either. Nobody of the small number of people who were there will forget that polar bear sighting on Edgeøya. And the same is true for the wild passage around the south cape and the adventurous landing that followed on the west coast. A walrus (dead) and a polar bear (very much alive) on Edgeøya. 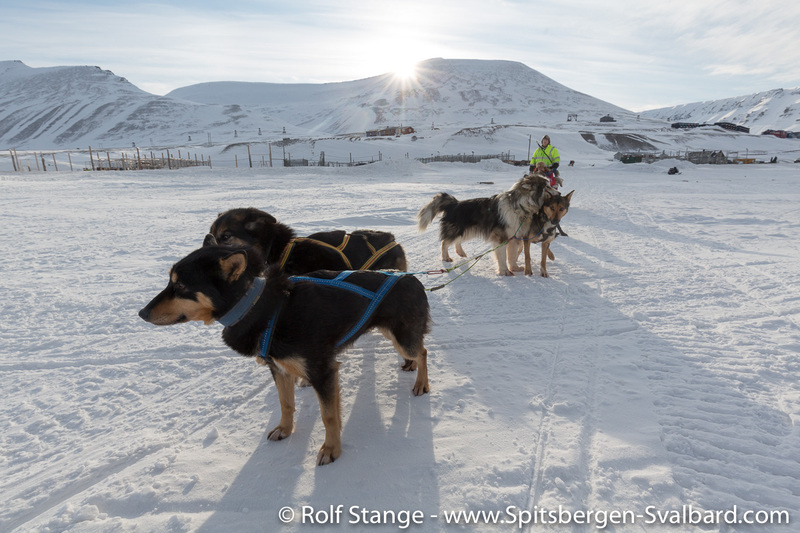 Oh yes, and then we still managed to finish the Spitsbergen calendar 2018 in late August. We are getting better every year, even though it was not available in July, as I had been hoping for. But as you can see, we were not lazy in the book (& related) publishing department either! 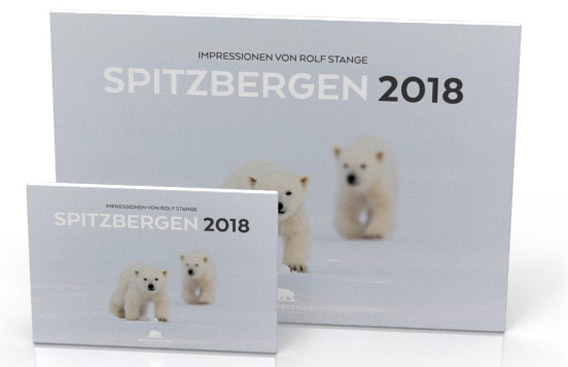 The Spitsbergen calendar 2018 came out in August. 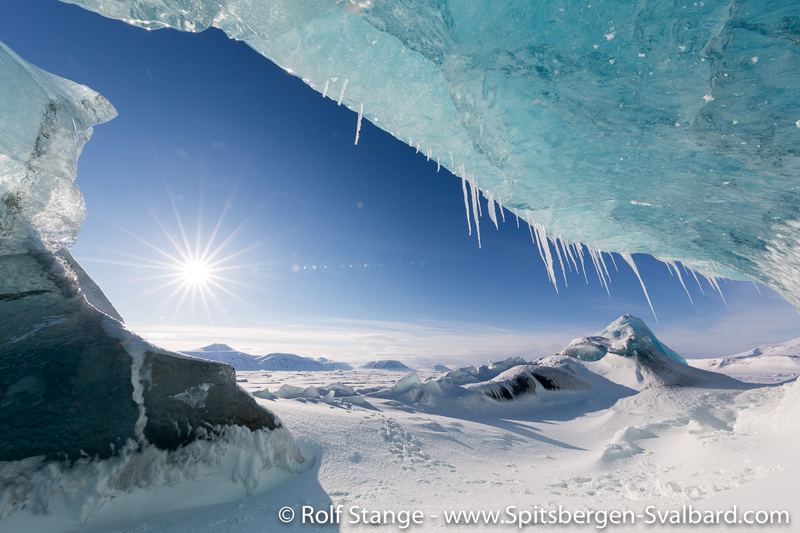 Considering public news, July was a rather calm month in Spitsbergen. Which is great. No news are good news. Of course, there is always something, but all within reason. 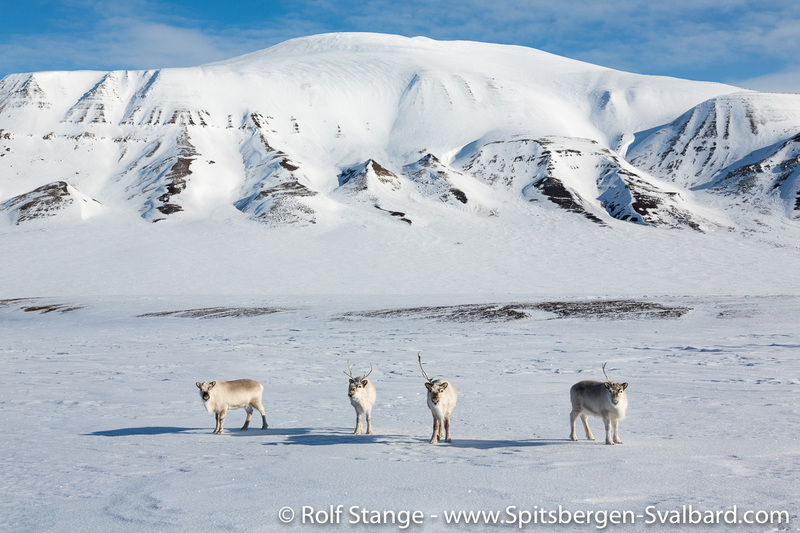 The reindeer were doing well, there were no avalanches and no extreme weather situations. We could pretty much just enjoy! And so we did, mostly with SV Antigua. 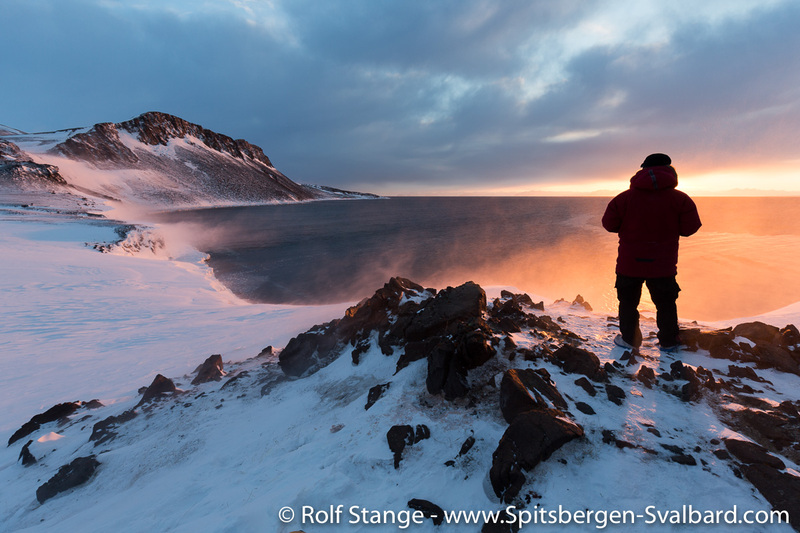 We started actually already in late June, and the first highlight – I am coming to my personal perspective – came quickly in shape of a rare landing near Spitsbergen’s south cape (Sørkapp). 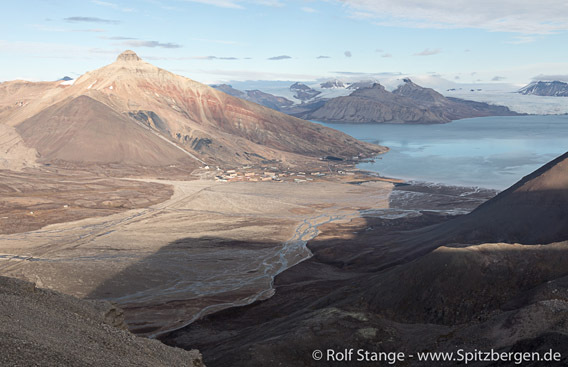 Landing close to Sørkapp (the south cape) of Spitsbergen. 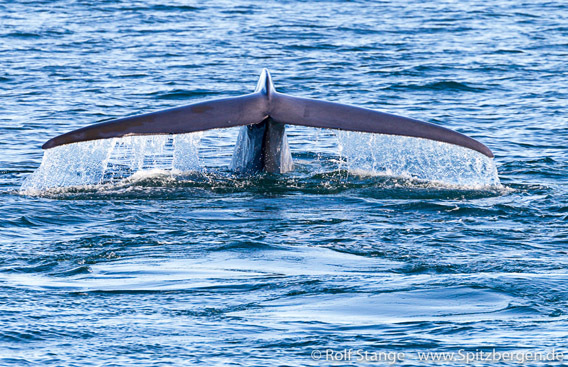 Other people who were there with me will probably rather remember the Blue whale that we saw close up later the same day, or the polar fox family a day later. And no doubt, these are all precious memories. But for me personally, well, I just love rare landings, these hidden places that almost nobody knows and even fewer people ever get to. But these places to all have their secrets. More often than not, there is something exciting to discover! 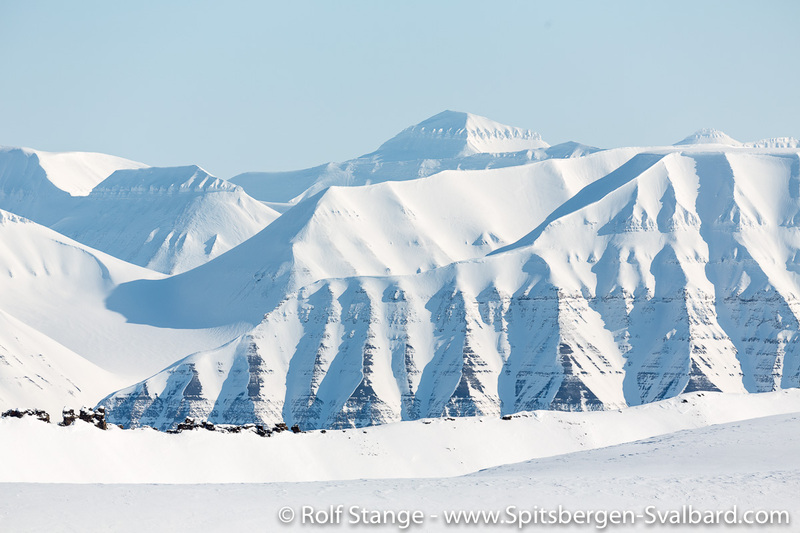 But still, the wildlife is a big chunk of Spitsbergen’s beauty. And the sighting of a female polar bear with one cub who were feasting on the remains of a dead whale on Danskøya were amongst the highlights of these weeks! Happy polar bear family and an unhappy whale on Danskøya. 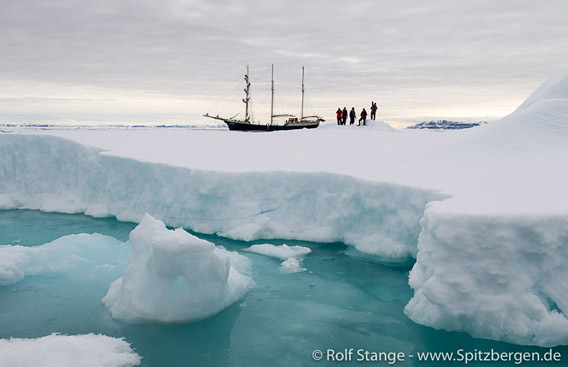 And if you ask anyone who was on board, then I am sure most will tell you that the landing on an ice floe is one of the most precious memories that they took home from this great trip. How often do you have the chance to stand on drift ice on 80 degrees north? Feel like Nansen! But not for 3 years … we left a bit earlier. Ice landing on 80 degrees north. 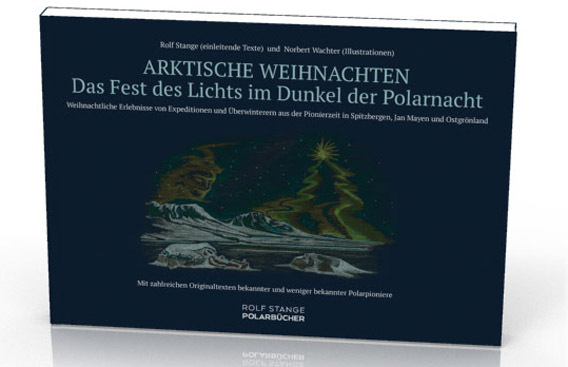 The arctic christmas book: finally in print in late July. 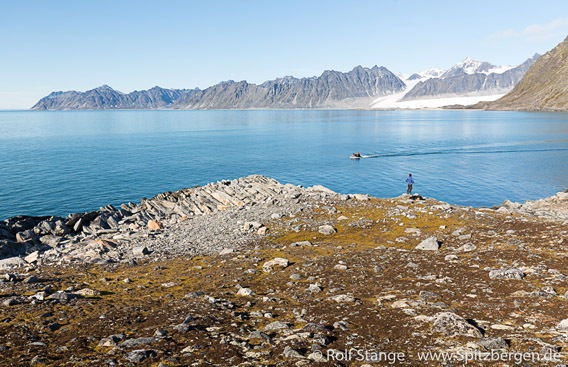 It is becoming increasingly difficult for the researchers on Spitsbergen to study the migrations of polar bears on the Barents Sea between Svalbard and Russia. There are about 3000 polar bears living in the area, but only about 300 polar bears can be studied by the researchers. 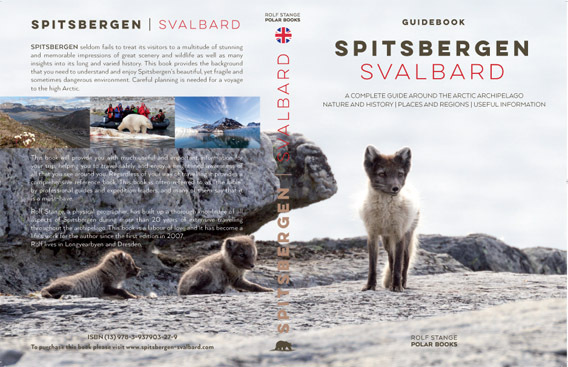 The reason is the withdrawal of sea ice, which causes that the migrating polar bears can no longer reach Svalbard. 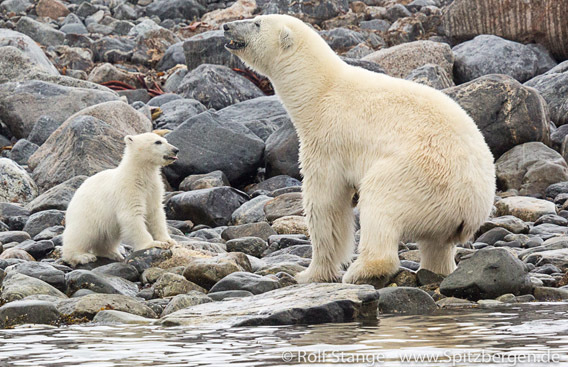 “The situation has changed drastically,” says polar bear researcher Jon Aars from the Norwegian Polar Institute. 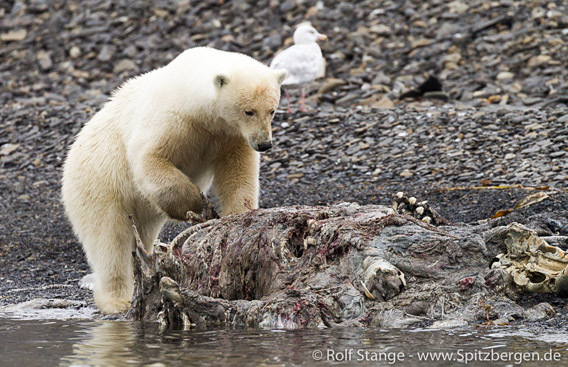 Since 1987, the polar bears on Spitsbergen have been systematically examined. 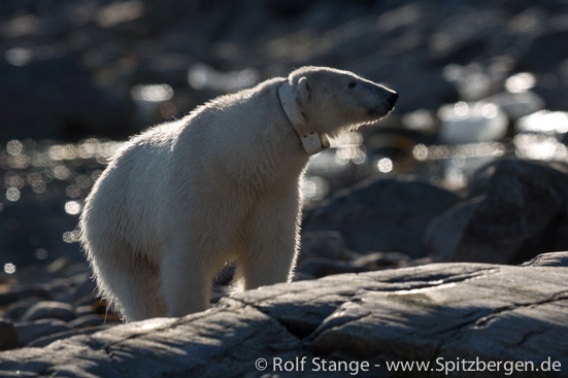 Until the 1990s, not only polar bears living all year round on Spitsbergen were observed, but also those who migrate over long distances on the sea ice on the Barents Sea between Russia and Spitsbergen. 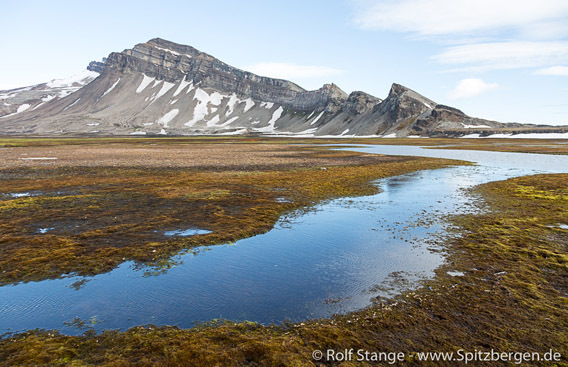 A large part of this stock could also be found on Spitsbergen for some time of the year, so that the migratory movements could be well studied. 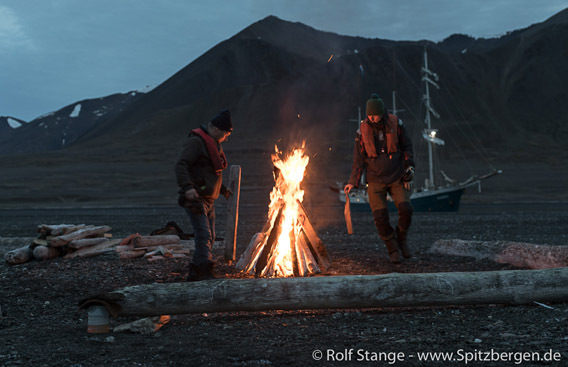 Today, almost only bears are tagged, who spend the whole year on Spitsbergen. Only two or three out of 20 tagged bears migrate to Russia. The result is less data about the migratory movements of the polar bears. 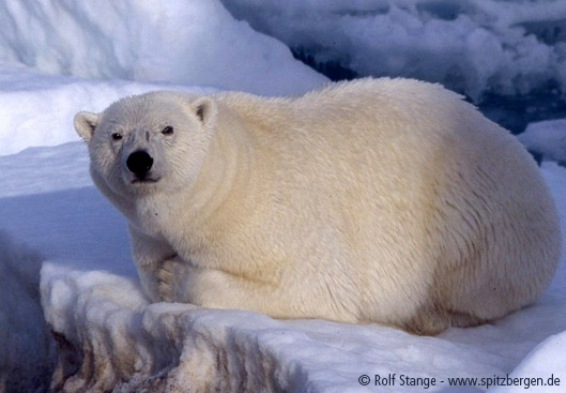 The data is needed to organize the conservation of polar bears. Jon Aars also appeals to the russian scientists to show more effort in researching the polar bears, for example on Franz-Josef-Land. 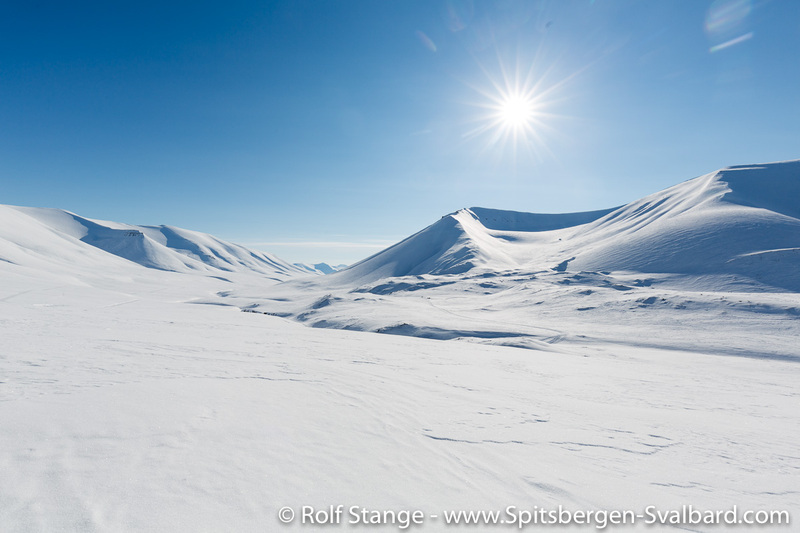 I have to start with a confession: I forgot the main excitement in Longyearbyen in April: the town was running out of toilet paper! 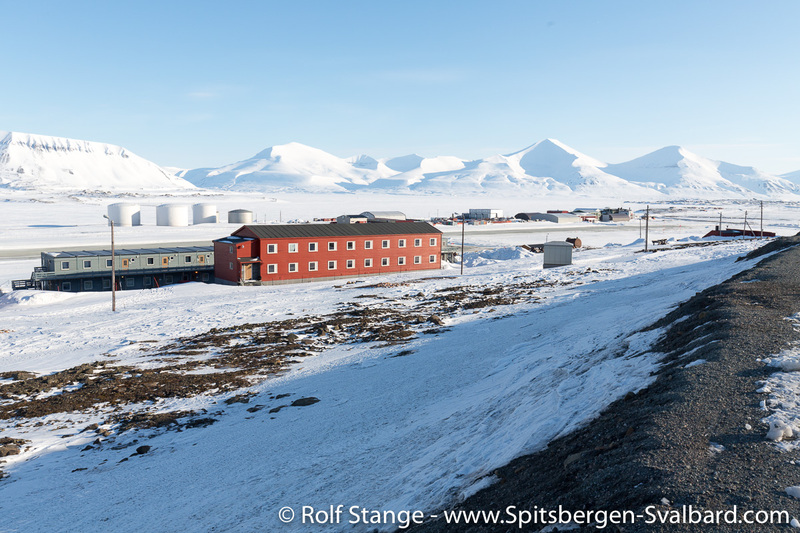 People in arctic Longyearbyen seem to a surprisingly large degree be willing to accept climate change, they keep cool when the Russian military supposedly exercises attacks on their home, who cares, some loss is part of the game. But no toilet paper anymore? That’s serious business! The excitement about the supposed flooding of the seed vault / “doomsday vault” falls into a similar category. Indeed, in October 2016, during a period with a lot of rain, there was some water coming into the entrance area of the vault. That should not have happened and those who were concerned with it were not happy and some money was to be spent to get things right, but what had actually happened was far from being any real drama. But that came more than half a year later in international media. Someone happened to pick up that marginalium, spiced it with some drama, tolerantly overlooked that it had all happened more than half a year ago and blew it out into the world, where it was picked up by surprisingly many media, including some serious ones. Nobody came on the idea to check what had really happened, there was a lot of recycling of copied information and that is usually not a good idea. 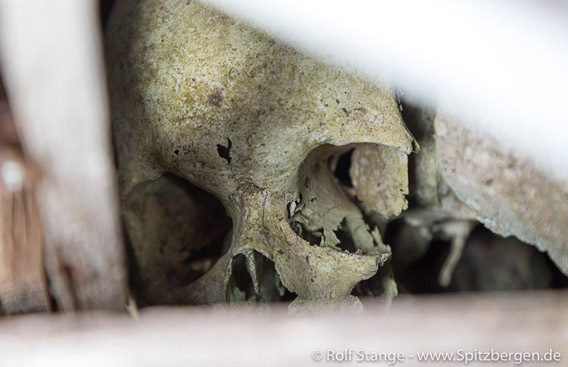 Checking the seed vault’s website would have been enough, but that was obviously too much to ask for. Well, I am happy that this website did not follow the hype. Regarding my own polar perspective, Jan Mayen was the main event in June. 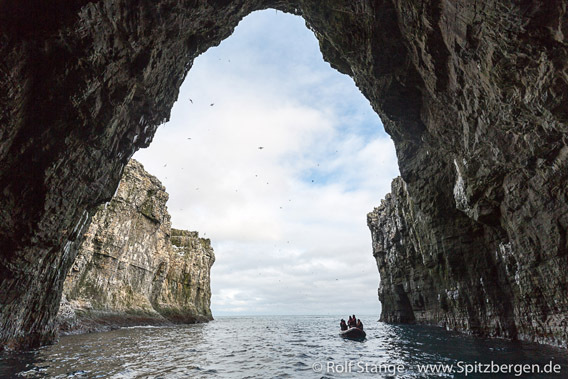 For the fourth time, I went to that volcanic island in the north, 3 days of sailing from Iceland, on a small boat across a big sea. Jan Mayen is an extremely fascinating place. The more time you spend there, the more you realize how much there is to see. As usual, we made a lot of kilometres during our various hikes. Next to many other impressions, the lava caves on Beerenberg were the main thing for me this time. 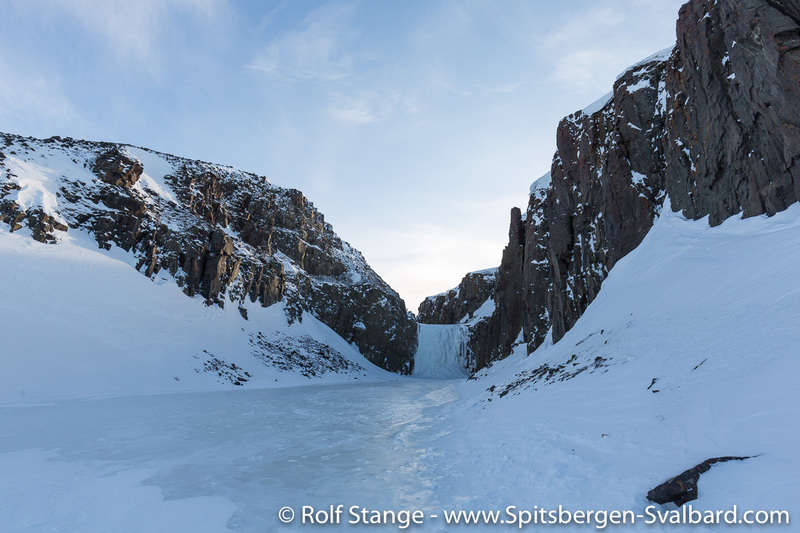 While a group of mountaineers climbed up to the peak of Beerenberg (where I had been in 2015), I took the opportunity to explore a couple of lava caves in Schmelckdalen on the south slope of Beerenberg. Stunning! 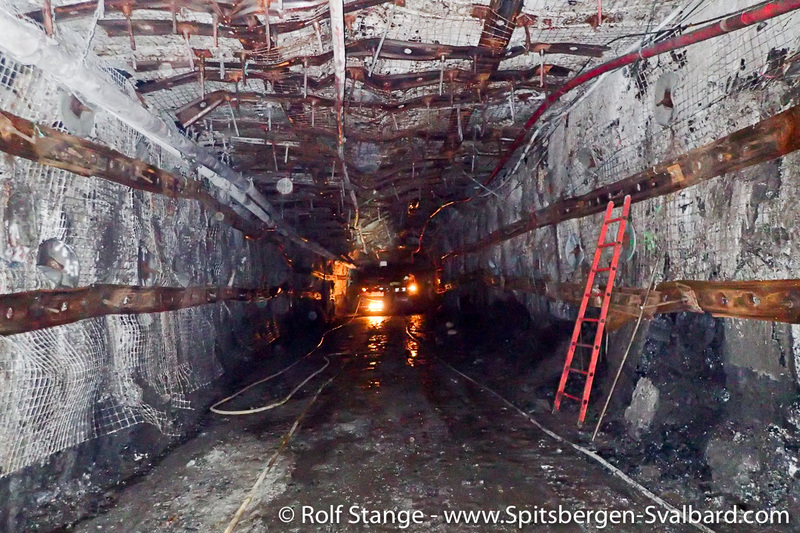 It is a bizarre feeling to be actually inside Beerenberg, in the guts of this arctic volcano. I probably don’t have to mention that it is a hard-to-get-to place. That was my highlight in June. 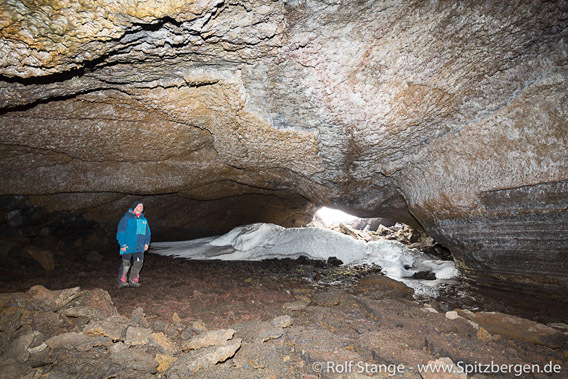 Lava cave in Schmelckdalen on Beerenberg, Jan Mayen. A highlight that remains a vivid memory was actually the trip to the coal mining settlement of Sveagruva, because it turned out to be a unique opportunity. 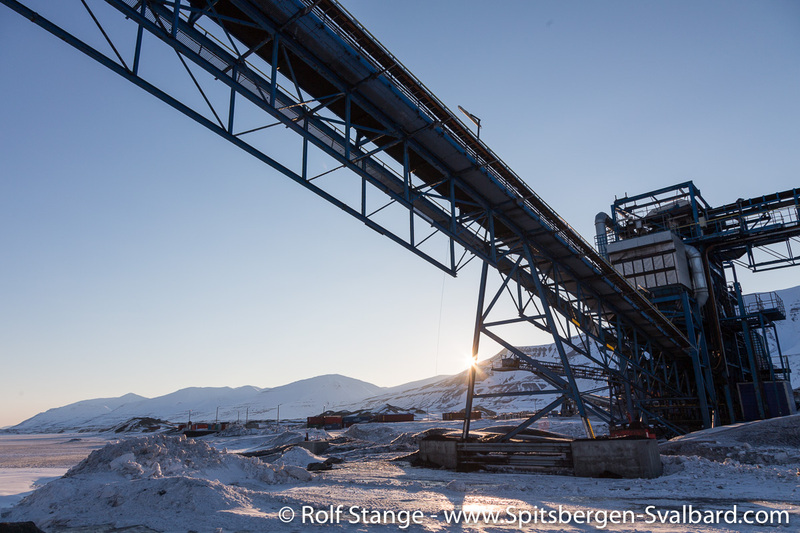 Coal mining was on standby at that time, there was only maintaince going on, but no production despite the opening of a brand new coal mine at Lunckefjellet in February 2014. It never went into productive operation. 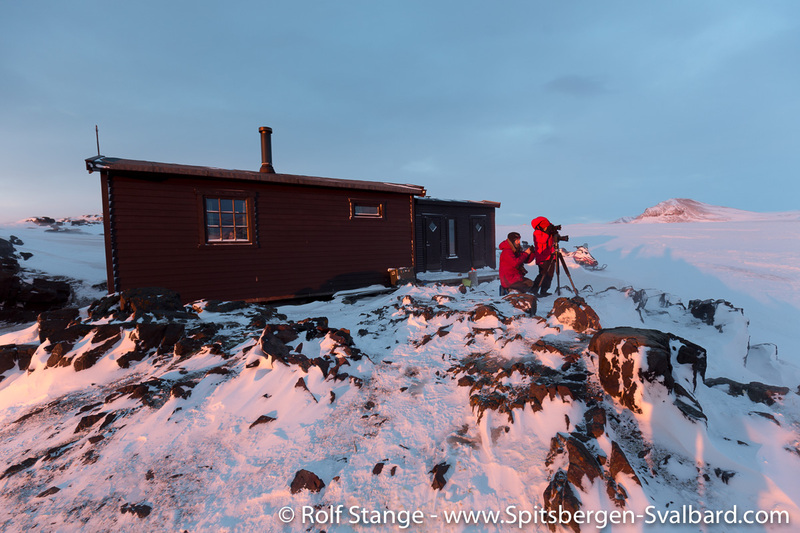 So the Store Norske Spitsbergen Kulkompani had decided to open Sveagruva for limited tourism. 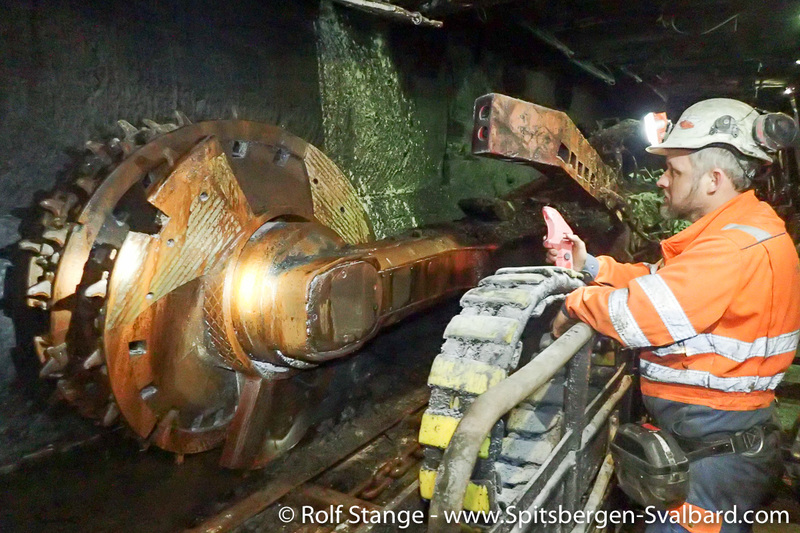 It was even possible to visit the coal mine, Svea Nord. 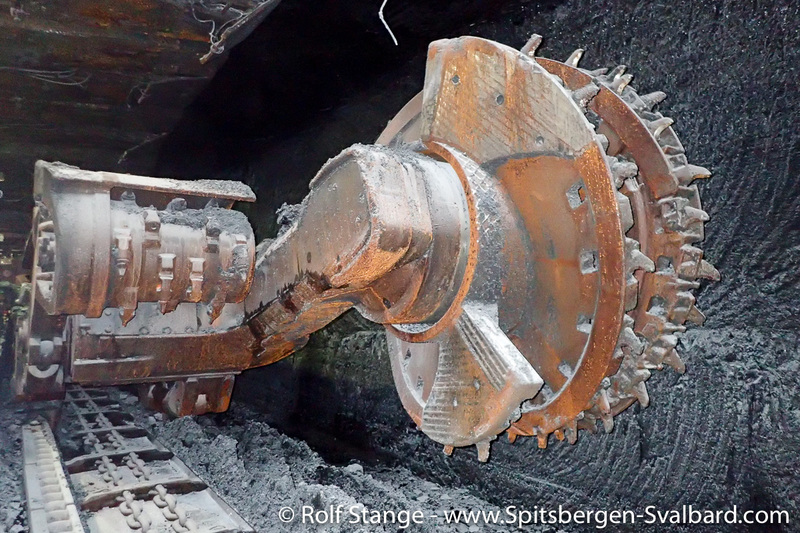 As the decision was made in Oslo in October 2017 that the days of coal mining in Sveagruva are over, the place and associated coal mines will be closed. It seems quite unlikely that there will be tourism or any other activitiy there in the future. 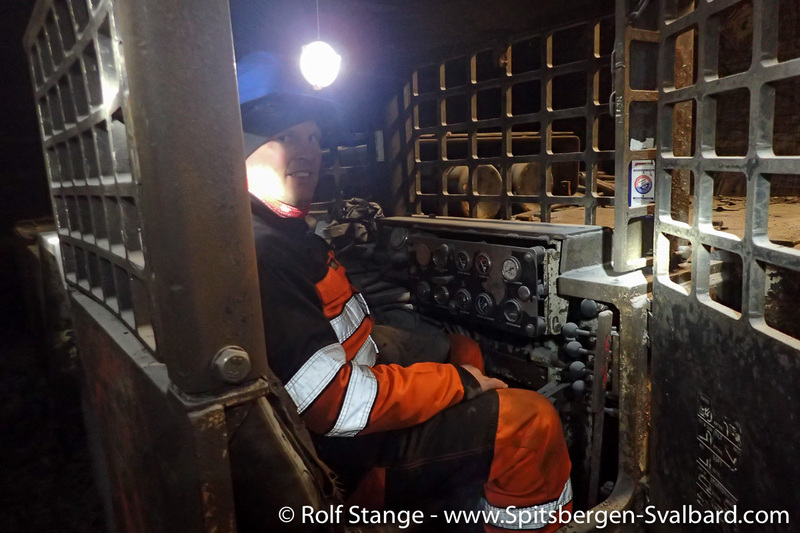 So it is good to have used that opportunity to visit Sveagruva and the mine, Svea Nord and to get a good impression of coal mining, which was the dominant activitiy in Spitsbergen for a century. And a coal mine is a fascinating place, indeed! 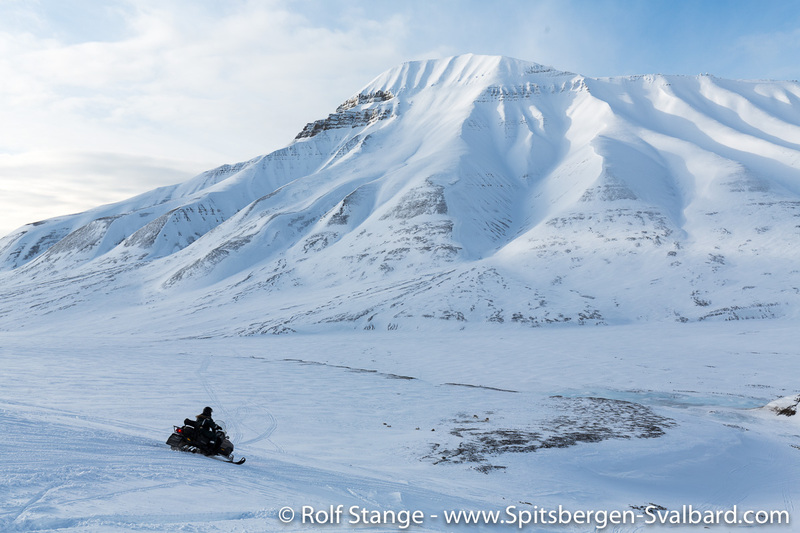 Talking about fjord ice: a Russian group made a tragic experience with fjord ice in Tempelfjord in late April, when their snow mobiles broke through the ice. 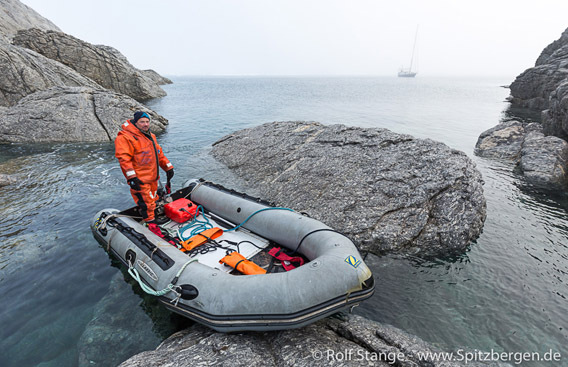 Several people went into the water and could only be saved under dramatic circumstances by the Norwegian SAR forces. Tragically, one guide died later in the hospital.